HOL-TestGen is a is a test case generator for specification based unit testing. HOL-TestGen is built on top of the specfication and theorem proving environment Isabelle/HOL. HOL-TestGen is free software; you can redistribute it and/or modify it under the terms of a BSD-style licence. HOL-TestGen 1.5 has been deposited in the Agency for the protection of programs (APP) IDDN.FR.001.220032.000.S.A.2011.000.10000 (Signed Paris, 3.6. 2011). It is developed by Achim D. Brucker, Lukas Brügger, Matthias Krieger, and Burkhart Wolff. hol-testgen-1.9.1-non-free.tgz (ca. 15MiB, MD5: bdd9d25575f2e81304a853cbf43b632b, signed with 0x580E02C0, 2017-08-31), supports Isabelle 2016-1. ChangeLog. < /br> The non-free distribution contains the Z3 SMT solver as well as certain add-ons that are subject to more restrictive licensing terms. hol-testgen-1.9.0-non-free.tgz (ca. 15MiB, MD5: cf855e9446ffbc381964c336ef2ad442, signed with 0x580E02C0, 2017-07-19), supports Isabelle 2016. ChangeLog. < /br> The non-free distribution contains the Z3 SMT solver as well as certain add-ons that are subject to more restrictive licensing terms. hol-testgen-1.8.0-pre.tar.gz (ca. 238 KiB, MD5: 9e600a1d88e684275a8f07e555c8a439, 2015-06-04), supports Isabelle 2013-2.
hol-testgen-1.7.1.tar.gz (ca. 5.3 MiB, MD5: 40df92dc26c2221ec0e92219f6356edd, 2012-11-19), supports Isabelle 2011-1.
hol-testgen-1.6.0-pre.tar.gz (ca. 2.5 MiB, MD5: 0b089d97864d1084825b0c5452cb36f8, 2012-07-09), supports Isabelle 2011.
hol-testgen-1.5.0.tar.gz (ca. 1.9 MiB, MD5: 5dc5092fe94a3a2fb99b6733fbd1ba3b, 2010-10-04), supports Isabelle 2009. Achim D. Brucker and Michael Herzberg. Formalizing (Web) Standards: An Application of Test and Proof. In TAP 2018: Tests And Proofs. Lecture Notes in Computer Science (10889), pages 159-166, Springer-Verlag , 2018. Achim D. Brucker and Burkhart Wolff. Monadic Sequence Testing and Explicit Test-Refinements. In TAP 2016: Tests And Proofs. Lecture Notes in Computer Science (9762), Springer-Verlag , 2016. Achim D. Brucker, Oto Havle, Yakoub Nemouchi, and Burkhart Wolff. Testing the IPC Protocol for a Real-Time Operating System. In Working Conference on Verified Software: Theories, Tools, and Experiments. Lecture Notes in Computer Science, Springer-Verlag , 2015. Achim D. Brucker, Lukas Brügger, and Burkhart Wolff. HOL-TestGen/FW: An Environment for Specification-based Firewall Conformance Testing. In International Colloquium on Theoretical Aspects of Computing (ICTAC). Lecture Notes in Computer Science (8049), pages 112-121, Springer-Verlag , 2013. Achim D. Brucker, Abderrahmane Feliachi, Yakoub Nemouchi, and Burkhart Wolff. Test Program Generation for a Microprocessor: A Case-Study. In TAP 2013: Tests And Proofs. Lecture Notes in Computer Science (7942), pages 76-95, Springer-Verlag , 2013. Abderrahmane Feliachi, Marie-Claude Gaudel, Makarius Wenzel, and Burkhart Wolff. The Circus Testing Theory Revisited in Isabelle/HOL. In ICFEM. Lecture Notes in Computer Science, 8144, pages 131-147, Springer, 2013. Lukas Brügger. A Framework for Modelling and Testing of Security Policies. ETH Zurich,2012. ETH Dissertation No. 20513. Abderrahmane Feliachi. Semantics-Based Testing for Circus. Université Paris Sud,2012. Abderrahmane Feliachi, Marie-Claude Gaudel, and Burkhart Wolff. Isabelle/Circus: A Process Specification and Verification Environment. In VSTTE. Lecture Notes in Computer Science, 7152, pages 243-260, 2012. Abderrahmane Feliachi, Burkhart Wolff, and Marie-Claude Gaudel. Isabelle/Circus. In Archive of Formal Proofs, 2012. Matthias P. Krieger. Test Generation and Animation Based on Object-Oriented Specifications. University Paris-Sud XI,2011. Achim D. Brucker, Lukas Brügger, Paul Kearney, and Burkhart Wolff. Verified Firewall Policy Transformations for Test-Case Generation. In Third International Conference on Software Testing, Verification, and Validation (ICST), pages 345-354, IEEE Computer Society , 2010. Achim D. Brucker, Matthias P. Krieger, Delphine Longuet, and Burkhart Wolff. A Specification-based Test Case Generation Method for UML/OCL. In MoDELS Workshops. Lecture Notes in Computer Science (6627), pages 334-348, Springer-Verlag , 2010. Selected best papers from all satellite events of the MoDELS 2010 conference. Workshop on OCL and Textual Modelling. Achim D. Brucker and Burkhart Wolff. HOL-TestGen: An Interactive Test-case Generation Framework. In Fundamental Approaches to Software Engineering (FASE09). Lecture Notes in Computer Science (5503), pages 417-420, Springer-Verlag , 2009. Achim D. Brucker, Lukas Brügger, and Burkhart Wolff. Model-based Firewall Conformance Testing. In Testcom/FATES 2008. Lecture Notes in Computer Science (5047), pages 103-118, Springer-Verlag , 2008. Achim D. Brucker and Burkhart Wolff. Test-Sequence Generation with HOL-TestGen - With an Application to Firewall Testing. In TAP 2007: Tests And Proofs. Lecture Notes in Computer Science (4454), pages 149-168, Springer-Verlag , 2007. Achim D. Brucker and Burkhart Wolff. Interactive Testing using HOL-TestGen. In Formal Approaches to Testing of Software. Lecture Notes in Computer Science (3997), Springer-Verlag , 2005. Achim D. Brucker and Burkhart Wolff. 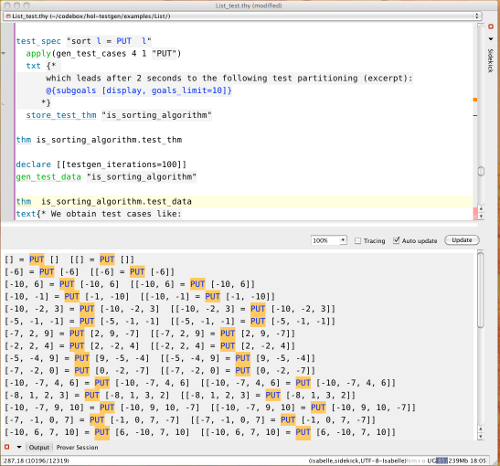 Symbolic Test Case Generation for Primitive Recursive Functions. In Formal Approaches to Testing of Software. Lecture Notes in Computer Science (3395), pages 16-32, Springer-Verlag , 2004.